A dense white cake laced with brown sugar and pineapple, topped with a maraschino cherries. 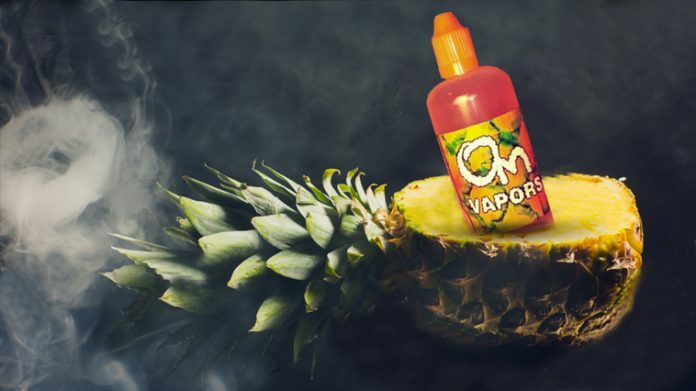 There’s a lot to love about The Tropics from Om Vapors! The branding used by Om Vapors is really quite nice. They use the same general graphic design on all their e-liquid lines, with some minor variations that work to keep everything consistent throughout. Everything from the large white Om logo, to e-juice names and the colorful background images work to give their bottles a bit of character. You won’t find any cartoon characters or vulgar wording here, and they’re definitely not needed! This just goes to show that a little extra work put in on label design can pay off in a big way. A warm and fluffy yellow cake, supported by layers of fresh pineapple. Hints of light brown sugar glaze throughout, mellow the tartness of the tropical fruit flavor. As if that weren’t enough, The Topics is topped with sweet maraschino cherries. The aromas coming from this bottle are a wake up call to my olfactory receptors. A sweet maraschino cherry takes the forefront followed by a dense white cake. Notes of pineapple, vanilla, and a hint of brown sugar are at play in the background. This should be one heck of a complex vape! Drop Dead 24mm with a single alien framed staple (.26ohms) from Saddlehorseblues, sitting on top of the Hypercar mod from Uwell. I started with the airflow shutdown 3/4 of the way, and kept it there for the majority of this review. Front – Light brown sugar and toasted nuts mixed with a dense white cake flavor upfront. Some acidity from the pineapple makes its way through the sweet bakery blend, but it’s far from potent. The maraschino juice sneaks its way into the scene as well; a taste that reminds me of a 7-up with liquid cherry juice. Middle – A mix of brown sugars (light and a touch of dark) mix with a vanilla white cake, producing a tasty layered dessert. The pineapple fruit is much more noticeable mid-vape, and brings along with it a good amount of acidity. The sweet cherry takes a back seat, and works to smooth out the flavor and create a velvety mouthfeel. End – The end is all about the pineapple. It’s only slightly tart thanks to the brown sugar and cherry, and works perfectly in combination with the dense (almost chewy) white cake. The Tropics seems to have a vanilla icing or vanilla bean thrown in the mix as well, that adds to the authenticity of the Pineapple Upside down cake. Aftertaste – With pineapple dessert flavored liquids of any kind, there’s normally a decent amount of lingering; especially those that are over sweetened. Thankfully, like every Om Vapors liquid I’ve tried thus far, they’ve managed to keep the sugar content to a minimum. This ensures a clean palate after each vape! Om Vapors uses a 75/25 blend on all their liquids, and to be honest, I actually prefer it over the industry standard 70/30. It supports a thicker vapor, and continues to produce the same great flavor. With my single framed alien build on a single 18650 mod, I was chucking some dense clouds, and reeling in big time flavor! I’ll be honest, pineapple is about as far from my favorite fruit as you can get. But the complexity of The Tropics, and Om Vapors ability to smooth out most of the acidity, kept me coming back for more. Recommendable? Authentic pineapple upside down cake dessert flavor that you can enjoy anytime. What’s not to love there?